With apologies to House Stark, Winter is not coming. Here in the United States, it. Has. Arrived. Much of North America is calling for bone chilling temperatures far into the negatives this week. Therefore, if at all possible, you should avoid leaving the comfort of your warm couch. Thankfully, you can borrow any number of ebooks and audiobooks from just such a location thanks to Libby and your library. 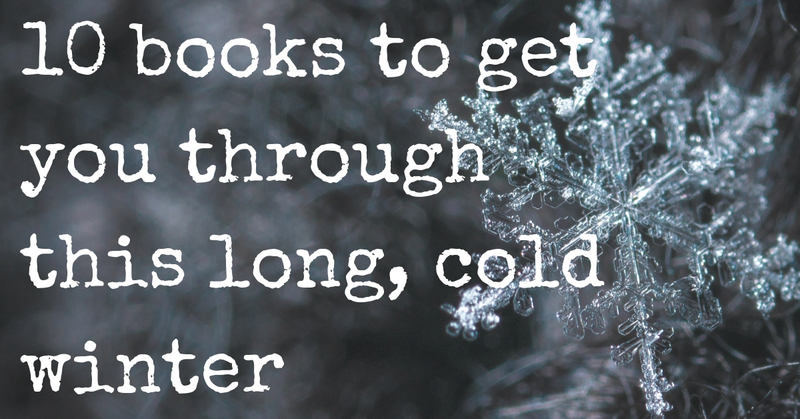 Long, cold days and nights call for long, warming books. Luckily we have just such a list for you. A Game of Thrones by George R.R. Martin – I couldn’t make that flawless GOT joke and not start the list here. 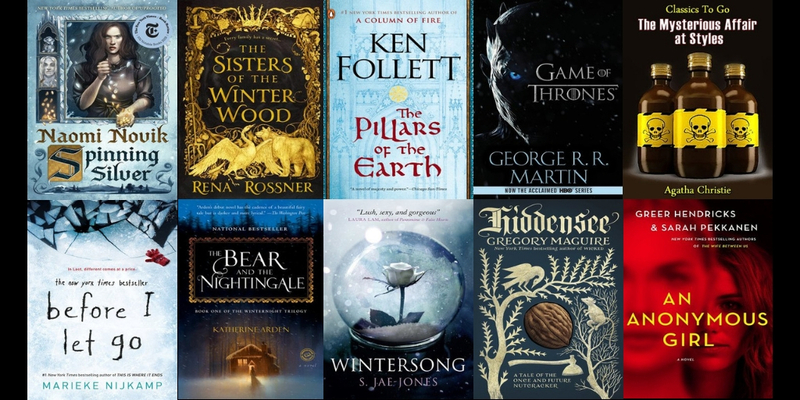 Return to Westeros as we all await the thrilling conclusion of the hit HBO series and the next book installment. Before I Let Go by Marieke Nijkamp – Best friends Corey and Kyra plan to reunite in their snow-covered hometown of Lost Creek, Alaska but just days before Corey is planning to return, Kyra mysteriously dies. What unfolds in an uncovering of chilling secrets and a dark community. The Bear and the Nightingale by Katherine Arden – A dark fairy tale set in the Russian wilderness and told through the eyes of Vasilisa. Her love for the story of Frost, the blue-eyed winter demon becomes all too real as her widowed father brings home an evil stepmother with aspirations of remaking their village in her likeness. The Sisters of the Winter Wood by Rena Rossner – In the forests of Moldova and Ukraine, two sisters are raised on the nature surrounding them and the safety of the woods. This isn’t to last when a roving band of mysterious men casts a spell of one of them. This re-imagined version of dark fairy stories will keep you guessing until the very end. Wintersong by S. Jae-Jones – Part Labyrinth. Part Beauty and the Beast. Entirely whimsical. This story of Liesl and Goblin King is written in a circular manner designed to confuse and entrap your mind. It’s beautiful and heartbreaking. Hiddensee by Gregory Maguire – Christmas may have passed but this origin story for the once and future Nutcracker is magical any time during the winter. The story of the famous Nutcracker is intertwined with the life of the mysterious toy maker named Drosselmeier who carves him. An Anonymous Girl by Greer Hendricks & Sarah Pekkanen – seeking women ages 18–32 to participate in a study on ethics and morality. Generous compensation. Anonymity guaranteed. When Jessica Farris signs up for a psychology study conducted by the mysterious Dr. Shields, she thinks all she’ll have to do is answer a few questions, collect her money, and leave. But as the questions grow more and more intense and invasive and the sessions become outings where Jess is told what to wear and how to act, she begins to feel as though Dr. Shields may know what she’s thinking…and what she’s hiding. The Mysterious Affair at Styles by Agatha Christie – This is the very first story where the queen of murder mystery, Agatha Christie, introduces readers to the great Hercule Poirot. Read the book that started it all, with an ending you won’t see coming. Spinning Silver by Naomi Novik – Few people know how to thread magic into stories like Naomi Novik and in Spinning Silver she does just that. Part myth, part fable, this story is split between two worlds of magic and power. The Pillars of the Earth by Ken Follett – The opening salvo of Follett’s masterpiece Kingsbridge trilogy tells a story spanning multiple lifetimes. One where a cathedral is built, lives are lost, families are created, and the struggle for the church is ever present. Ambition and anarchy are ever present in this sprawling medieval canvas.